We are a Massachusetts certified emissions repair shop, West Lynn Auto Service provides full-service auto care at affordable rates, topped by friendly service. Our staff expertise and customer service is unbeatable. Throughout the past few decades, our family-owned and operated shop has served the greater Lynn, MA community with pride, and continues to do so. in day out with one goal in mind: community. You can trust our local shop to offer the quality service you’re looking for every time. At West Lynn Auto Service we are a CERT (Certified Emissions Repair Technician) repair shop. To be CERT our technician has passed a state-required training program. 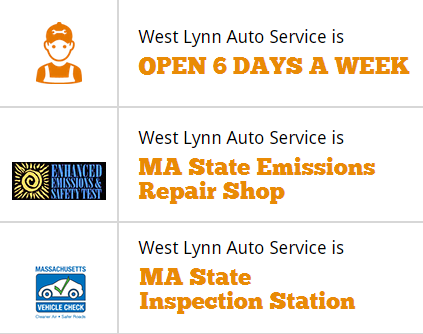 West Lynn Auto Service is a MA state certified emissions repair facility. Contact us at 781-595-9838 or visit us today for emission-related repairs and services.